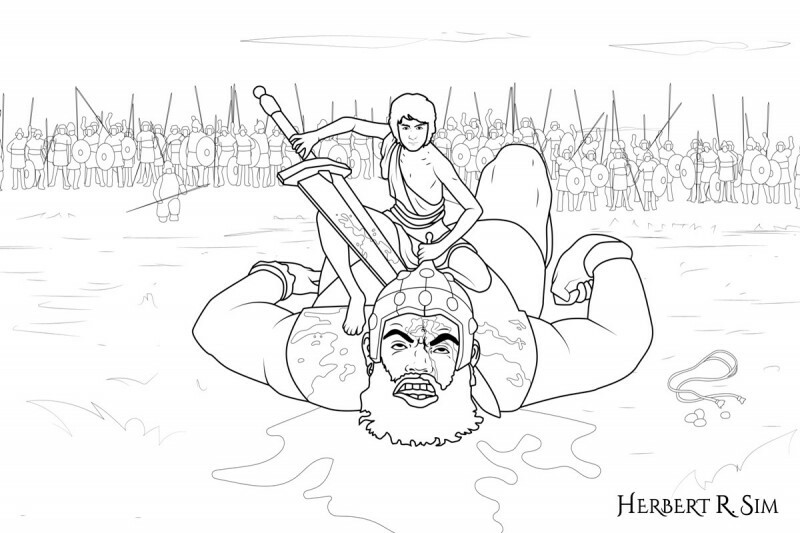 I depict the renown feat by God, through the hands of a young boy – David, defeating a giant, in the literal sense, in my latest illustration entitled “David & Goliath: Slaying The Giant”. David is illustrated to resemble Daniel Radcliffe from ‘Harry Potter’ series. 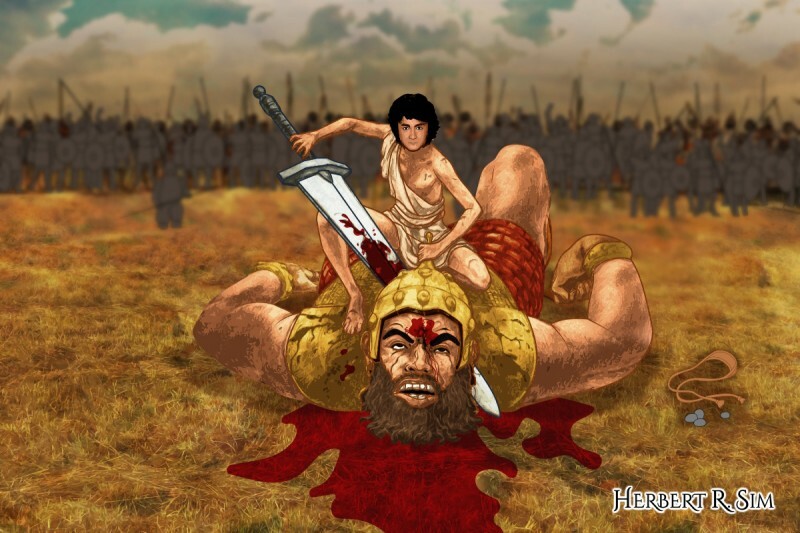 Ranked among the top 10 favourite Bible stories is David and Goliath (1 Samuel 17.1–58). It is an epic story about a giant warrior Goliath who was defeated at the hands of a young boy David, who eventually became king. Jesus Christ was also through the bloodline of King David, which indicates his royal origin. The phrase “David and Goliath” has taken on a more popular meaning these days, denoting an underdog situation, a contest where a smaller, weaker opponent faces a much bigger, stronger adversary. 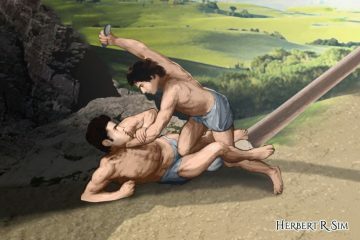 In my illustration, I specifically focused on 1 Samuel Chapter 17 versus 51, where David stood over him, took hold of Goliath’s sword, and decapitated him. Also, I made sure to illustrate as accurately as I can, capturing details from 1 Samuel Chapter 17 versus 20, where it shows the ‘five smooth stones from the stream’, four stones left alongside the sling, and the one stone that killed Goliath. And I chose to illustrate young David to resemble that of Daniel Radcliffe, who played the current trending fantasy book series ‘Harry Potter‘. Another actor I considered illustrating young David to resemble was Macaulay Culkin from movie series ‘Home Alone’. Alas, I settled with Daniel Radcliffe, as he is currently the trending, most popular teen actor at the moment. Also, in that book and movie series, Harry Potter, was in a similar position, in a prophecy foretold to slay a much bigger, stronger adversary, giant. “The one with the power to vanquish the Dark Lord approaches…”. The ‘Dark Lord’ in the ‘Harry Potter’ story referred to Lord Voldemort. Although Young David was illustrated to resemble Daniel Radcliffe from ‘Harry Potter’ series, I had to remove his spectacles as it does not reflect the era of David’s time. Also, you would notice the difference from the above initial sketch, is the army that stood around, and behind them. I revised on the armor and weaponry, from the Roman style ones, which were of a different era, hundreds of years later. 4 A champion named Goliath, who was from Gath, came out of the Philistine camp. His height was six cubits and a span.5 He had a bronze helmet on his head and wore a coat of scale armor of bronze weighing five thousand shekels; 6 on his legs he wore bronze greaves, and a bronze javelin was slung on his back. 7 His spear shaft was like a weaver’s rod, and its iron point weighed six hundred shekels. His shield bearer went ahead of him. 8 Goliath stood and shouted to the ranks of Israel, “Why do you come out and line up for battle? Am I not a Philistine, and are you not the servants of Saul? Choose a man and have him come down to me. 9 If he is able to fight and kill me, we will become your subjects; but if I overcome him and kill him, you will become our subjects and serve us.”10 Then the Philistine said, “This day I defy the armies of Israel! Give me a man and let us fight each other.” 11 On hearing the Philistine’s words, Saul and all the Israelites were dismayed and terrified. 12 Now David was the son of an Ephrathite named Jesse, who was from Bethlehem in Judah. Jesse had eight sons, and in Saul’s time he was very old. 13 Jesse’s three oldest sons had followed Saul to the war: The firstborn was Eliab; the second, Abinadab; and the third, Shammah.14 David was the youngest. The three oldest followed Saul, 15 but David went back and forth from Saul to tend his father’s sheep at Bethlehem. 20 Early in the morning David left the flock in the care of a shepherd, loaded up and set out, as Jesse had directed. He reached the camp as the army was going out to its battle positions, shouting the war cry.21 Israel and the Philistines were drawing up their lines facing each other.22 David left his things with the keeper of supplies, ran to the battle lines and asked his brothers how they were. 23 As he was talking with them, Goliath, the Philistine champion from Gath, stepped out from his lines and shouted his usual defiance, and David heard it. 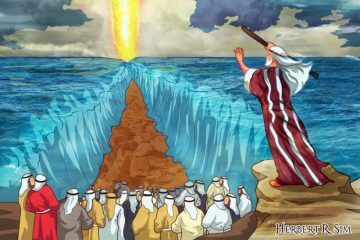 24 Whenever the Israelites saw the man, they all fled from him in great fear. 48 As the Philistine moved closer to attack him, David ran quickly toward the battle line to meet him. 49 Reaching into his bag and taking out a stone, he slung it and struck the Philistine on the forehead. The stone sank into his forehead, and he fell face down on the ground. When the Philistines saw that their hero was dead, they turned and ran.52 Then the men of Israel and Judah surged forward with a shout and pursued the Philistines to the entrance of Gath and to the gates of Ekron. Their dead were strewn along the Shaaraim road to Gath and Ekron. 53 When the Israelites returned from chasing the Philistines, they plundered their camp. 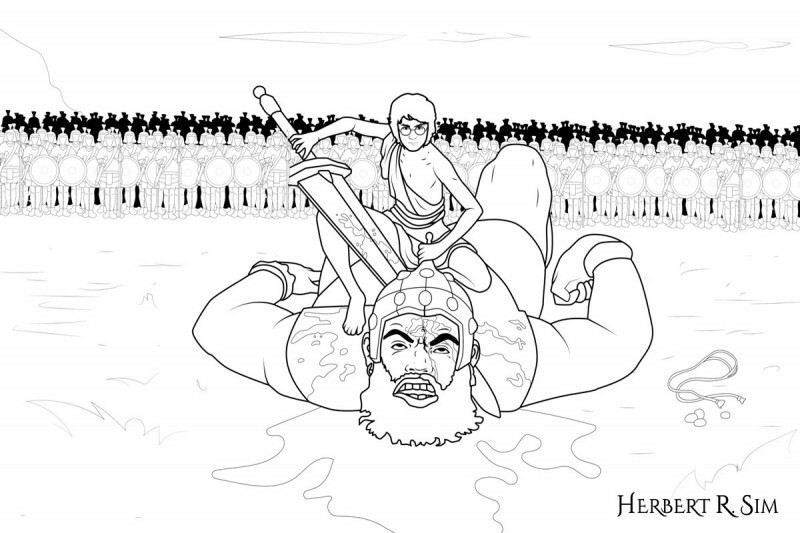 The focus in my illustration is 1 Samuel Chapter 17 versus 51, young David decapitating the head of Goliath with the Philistine’s own sword; while showcasing 1 Samuel Chapter 17 versus 40, the ‘five smooth stones from the stream’, four stones left alongside the sling, and the one stone that killed Goliath.